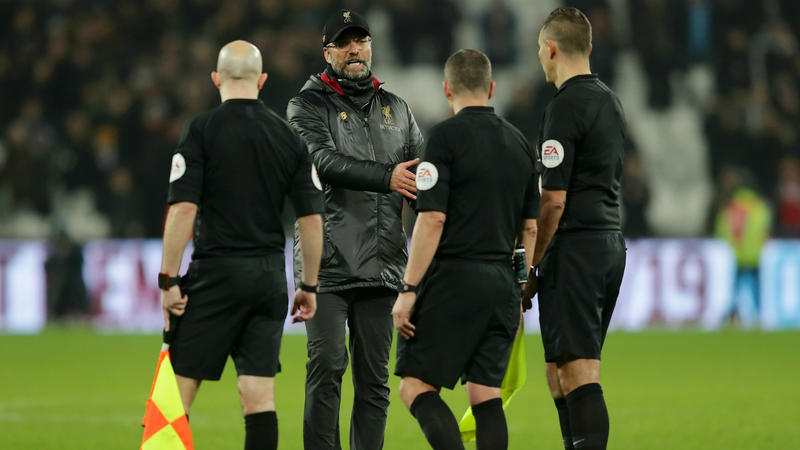 The Football Association (FA) has charged Jurgen Klopp for his comments about referee Kevin Friend following Liverpool's draw with West Ham on February 4. The Reds went ahead through a Sadio Mane goal but the officials failed to spot James Milner in a clear offside position in the build-up, something which Klopp suggested influenced Friend's decision-making in the rest of the game. Speaking to Sky Sports, he said: "There were so many situations where it was 50-50 or 60-40... [he gave a] free-kick for the other team. As a human being, I know if I make a big mistake in the first half, I don't want to open the gap even more." The FA said in a statement on Wednesday: "Jurgen Klopp has today been charged with a breach of FA Rule E3. "It is alleged that comments he made in a post-match interview following Liverpool’s league game against West Ham United on February 4 2019 breached Rule E3(1) as they questioned the integrity of the match referee and/or implied bias." Liverpool's next match in the Premier League is on February 24, when they head to Old Trafford to face fierce rivals Manchester United.